when we are being asked to go deeper and into greater expansion to our potential and our visions. Where we no longer have the tolerance for a mediocre life, for lack, and for the refusal of the capacity and fullness of our lives and the impact of our purpose in the world. This stage and this moment where we know it is time and that we are ready to step into the full potential of what calls us to life is where the unbridled mastery 1:1 was crafted to hold you. In 2014, I was facing a reality of losing my dreams and calling of partnering with horses, I was in 60k debt, not making money and knowing I was at a crossroads. Or I could rise up to where it was calling me. Because I had a moment of staring at my horses and knowing that this was an important marker on my journey, where I was given a choice to meet the challenge and expansion of myself, my purpose and what I was meant to hold in this world. And I chose to meet that challenge with a statement. And then I defined it and I let myself be open to that energy and my higher calling have it’s way with me. It took courage, I had to be willing to transform, to shift, to align to a deeper place within myself, to anchor myself deeply into the space of possibility and belief even when I had no proof of it, but I had a stubborn streak in me and I refused to let my purpose go down in fear because that would be something I would hold regret around for the rest of my life. There is something powerful that happens when we make a choice to step into our higher calling, when we decide to define our own beliefs, to do the inner work to support it and refuse to allow our fears and doubts shadows the capacity and greater calling and impact of our lives and the purpose we were born to create through. It is for those that know it is time for them to make that choice to create the breakthrough they have been desperate for within themselves, within their business and within their own mastery of their craft and medicine that is seeking to be expressed more boldly in the world. What happened when I made that choice was 6 months later I hit 6 figures, after barely making money at all, more deeply the confidence in my authentic voice grew, my practice filled, I saw the impact of the spaces I held and watched brilliant women step into theirs and then watched as my biggest dream of having my own land and herd of rescues come true. Now the capacity to my purpose continues to expand around me, I not only coach I train others that are called to the horse work, I develop leaders in their strengths and vision, and I make space for dreams and medicine to be made manifest in the world. In this moment there is a part of you that is speaking to you and saying… now is the time to go bold, to be purposeful, to express yourself in the depth of who you are and what you bring to the world and to claim your success and watching your vision manifest alongside of it. It is about you finally claiming something deep within yourself, a clarity of what you are here to do, not on the scale you are comfortable with, but on the scale in which you were meant to step into. This is also about honoring your footprint, your purpose, your legacy, your life’s purpose work in a way that you are not. To create space where you can be open to letting that greater impact be woven into your work, along with the clarity of who you are called to serve and with what authenticity and message you are meant to serve it. And finally, of meeting an aspect of yourself that is already anchored in mastery of yourself, of your craft and what your naturally brilliantly and intuitively great at, and your ability to create an abundant life and business alongside of it. Because the clarity and certainty of our purpose is meant to go hand in hand in our own personal fulfillment and abundance for our life. What is unique about the spaces I hold along with my own medicine is the inclusion of the horses into the conversation. 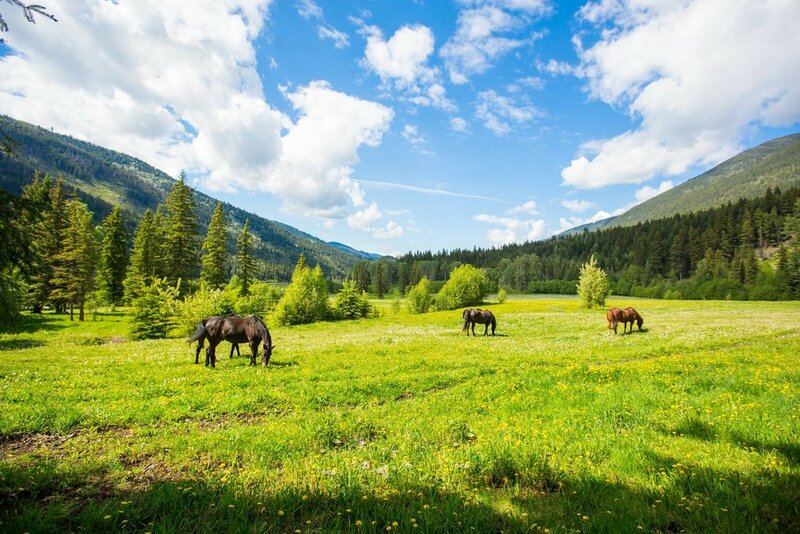 This space comes with an inclusion of a private retreat experience with the herd at the ranch that is home to our own wisdom and magic for you sink into. 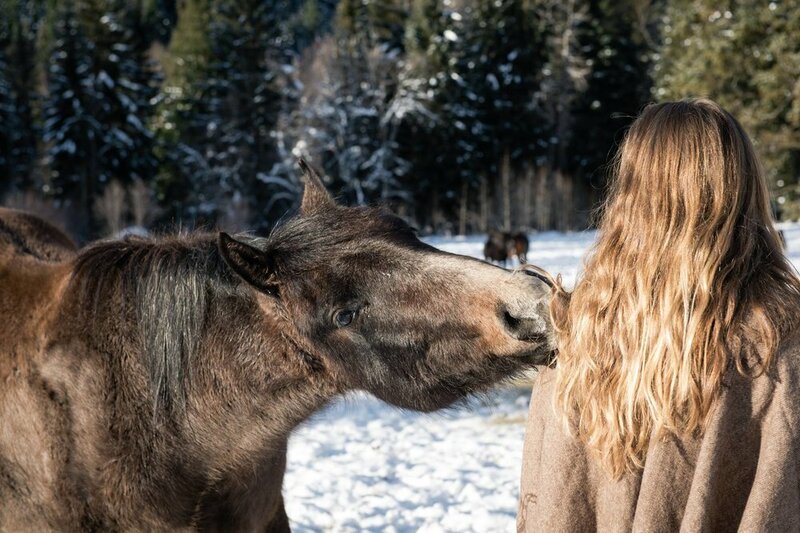 The horses are naturally intuitive due to their nature as prey. They tune into us at a much deeper level with the ability to read the energy behind our words, our body language and our intent. In this way they are able to pierce beyond the surface of our fears taking us deep into the core of where we really limit ourselves and giving us a tangible and profound mirror of the part of us that does not hold or identify with that wound. When we are being asked to create new pathways, we have to have the ability to anchor into them and then continue to pave them. The horses give us a new pathway that is impossible not to anchor into, so a new way of being and relating to ourselves and our purpose becomes something we can’t not witness or choose in our day to day. 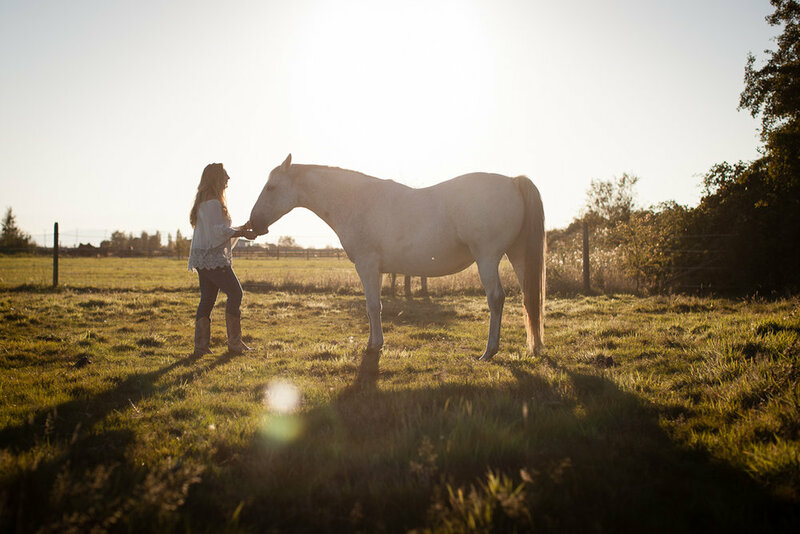 They are also mirrors of authenticity and intuition, in my own work training people in partnering with horses we learn to hone or crafts as leaders and also in our deep insight and awareness into understanding our intuition and how we masterfully create spaces for our clients to transform. An aspect of our time together in this year is not just going to be about uncovering your natural strengths and gifts, and creating your offerings around them, but honing your skill as a facilitator so you in turn can hold masterful spaces for your clients. The horses are going to provide you an understanding of a deeper intuition that we don’t get in our person to person reflection that will have your confidence in what you are picking up around the spaces of your business, yourself and your clients, palpable and easy to trust and lead through. In transparency, when I sat down to tune into this space and what it wanted to be a year was strong and solid and here is why. The truth is, it takes time for us develop our courage and our confidence in relationship to what we are building through the bigness of our purpose and our practices to the capacity we are wanting. And my interest in my mentorship is to not just give you the tools and send you on your way, but to be with you as you test them out, master them, founder and then finally find the success that you will create when those new pathways of being and of mastery are solid. It is also a beautiful thing to have a solid container of support as we evolve, realign, and be tested in our true desire for greatness when we decide to step into it. So will be there, for a full year, of support, of mentorship, of calling you forth, of reminding you what you stand for and why you are pushing yourself beyond your boundaries the way you are. And I will hold you to them so stay in the process as the rewards and the manifestations begin to manifest in your life. My commitment and my stake for my spaces and for my clients is to create a container where there is not just clarity, but there is confidence, courage, success and manifestation. Where outcomes and results are held in high regard and where there is no slipping back down the mountain you have just climbed. A foundation that can be built upon for years, that will be lasting in it’s sustainability of success and that will continue to flourish and grow as you do as the leader of it. A deeper knowing and understanding of your personal medicine, purpose and how that manifest into offering. A trust in how you create and show up in the world that brings confidence to your voice and everything you create. A full practice of clients that inspire and love working with you. Increase of income in your practice and a transformation of how you hold abundance and money in your life and practice. A clarity of vision on the big picture of what you are building through your legacy and life’s purpose work and how to ground that into reality and make it real. A honing of your craft and intuition in how you masterfully hold space for your own clients. Freedom from past fears and limitations that have held you back and paralyzed for too long. A claiming of your authentic voice in the world, you are showing up with boldness and clarity of what your message is and how to communicate that with impact and results in your practice. Confidence in yourself what you hold space for which leads to a greater permission and boldness of what you create. Price includes retreat experience at the ranch. I wanted to share a quick note to and about the power of Hillary. I enrolled in the 6 week intensive and had my first coaching call on Friday. It was amazing! Hillary encouraged me to go deeper than ever on the essence of my work. She encouraged me to move to the crystallized portion of who I am, am meant to work with, what I offer them and what it looks like when I embrace my power and fully step into my purpose and passions. For me accessing guidance for all of these inquiries are through art and specifically what I call Priestess Portraits. This is how I’m able to form a direct pathway to spirit and heart. I’m allowed glimpses into my inner consciousness and draw out the wisdom that I’m seeking. This work is so incredible and is at the core of what I’m meant to share. The main message that I received was that we all contain an inner priestess and that she is a powerful expression of the divine feminine. She resides at the altar of her life and conjures all the elements that she needs to shape shift her world. She aligns with her inner wisdom and gifts and embraces her uniqueness and has sacred work to be done. My job is to show those I work with this inner pathway to spirit and to remind them of how powerful they are. I didn’t trust a higher power. I was abused, badly, in many, many ways. I had done SO much work—alone—because I didn’t trust anyone. Every single adult or spiritual leader in my life had either abused me or sought to destroy me. I was really ok going at it alone. I had come so far. And then I just didn’t know what was next. I had no clue what the next thing to do was. I didn’t know how to proceed. I have always had a deep knowing. I know I am valuable despite being abused. I know I am loved and can show love despite being shown and told otherwise. But I kept experiencing the exact opposites of what I inherently knew—and I didn’t know why—and I didn’t know how to break that cycle. Then the universe brought me Hillary. And of course, the first thing I did was resist. I finally took the leap, and it was a BIG LEAP for me. I paid in full for six months of coaching. I used money that was planned for something else, but I knew that if I didn’t pay in full I wouldn’t complete the sessions. I had many (many) emotional breakdowns and personal crises during our sessions and Hillary always—always—remained an anchor. She always reminded of me who I was at my core. Above all, she taught me to trust my higher source, my inner voice, higher self, my intuition. All these terms for the same thing. She taught me how to trust me. how to BE me—fully and without apology. I truly would’ve never fathomed that I’d be here today, fully me, more alive than I’ve ever been, completely sure of myself, full of confidence, and ready to move to the next phase of my life here, which includes very little struggling, because I’ve done that for far too long. This is a new phase that includes stepping fully into my power and being of service to others—that is something I wasn’t willing or able to do without Hillary’s guidance. I started Hillary’s Awaken Manifest Magic circle last week with the option of coaching emails. I would like to share the amazing journey it has already started for me. It really does Awaken and manifest magic. Since starting the circle and the coaching emails with Hillary I have had a total shift in my direction. When I sent my first email I said I had started my home based massage business that I wanted help with and had enrolled to do an acupuncture degree. Over the last couple of days I realised that I had enrolled in acupuncture it because I thought it would be a good thing to do but I wasn’t passionate about it. I decided two days ago not to do the acupuncture degree and decided instead to sign up for meditation and mindfulness teacher training so I can offer meditation classes to my Clients and have mini retreat days. I was even looking at Equine assisted therapy courses as always in my big dream I wanted people who come to me to be part of the energy of my horses. Then after looking at these courses I get up the next morning and in my Facebook feed there is an equine assisted therapy workshop advertised in my area in 3 weeks time!! How is that for the universe putting opportunity in my path. Anyway big shift in my thinking. No more doing what I think will be popular or profitable, now to just do what comes from my heart.